The match of the day between Garbiñe Muguruza and Dominika Cibulkova totally lived up to expectation; Muguruza was two points from the defeat but came fighting back for arguably her best win of the year, 6-7(3) 6-3 7-5 in two hours and 46 minutes. There were some brutal rallies, big winners and many, MANY momentum shifts. In the end, it was another tough loss for Cibulkova who had match point against Agnieszka Radwanska last week in Indian Wells. A pair of thunderous returns helped Muguruza break to 6-5 in a tight and tense third set, and she followed it up with some stellar serving to grab the victory. Here are some great shots from Christopher Levy (@tennis_shots) on Twitter from the Muguruza-Cibulkova match. Domi in the tennis today. Angelique Kerber picked up her first win on the WTA tour since her triumph in Melbourne… and she did it in style, thrashing Barbora Strycova, 6-1 6-1 in 63 minutes. Kerber finished with 15 winners to 15 unforced errors but the key stat was that she converted all six break point opportunities. Australian Open win or no Australian Open win, Kerber really needed a win like this after a 3-match losing skid. Played well overall, too! Naomi Osaka produced a stunning display to overwhelm Sara Errani, 6-1 6-3. Osaka didn’t drop a point on her serve in the first set. Errani made a comeback in the second set but Osaka settled again, winning the last two games with a myriad of winners. I’m excited to see how Osaka develops over the next few years because she is a big talent. Naomi Osaka has an explosive game, amazing hair AND she likes Pokémon. I mean, what's there not to love?! Gibbs’s progression this year has been quite remarkable. She didn’t drop serve once in Friday’s match against Mladenovic; after comfortably coming through the opening set, she broke serve in the very first game of the second set and held onto it from that point on. Gibbs plays Muguruza in the third round… interesting. Andddd now add to that Vinci’s first result from Miami where she came from behind to defeat Lucie Hradecka, 1-6 6-4 7-6(5). Vinci finds her 1st serve & forehand late in the 1st set & comes back to outmaneuver an increasingly inconsistent Hradecka, 16 64 76(5). Elena Vesnina won her third match against Venus Williams, beating the American, 6-0 6-7(5) 6-2. It was a fun match with peak Vesnina showing up in the first set. Venus showed her battling qualities to nick the second set, having saved a match point, but Vesnina was just too strong in the decider. CoCo Vandeweghe defeated the number six seed, Carla Suárez Navarro, 6-4, 6-2 – CSN didn’t look 100% from the ankle injury she picked up at Indian Wells but another superb performance by Vandeweghe. 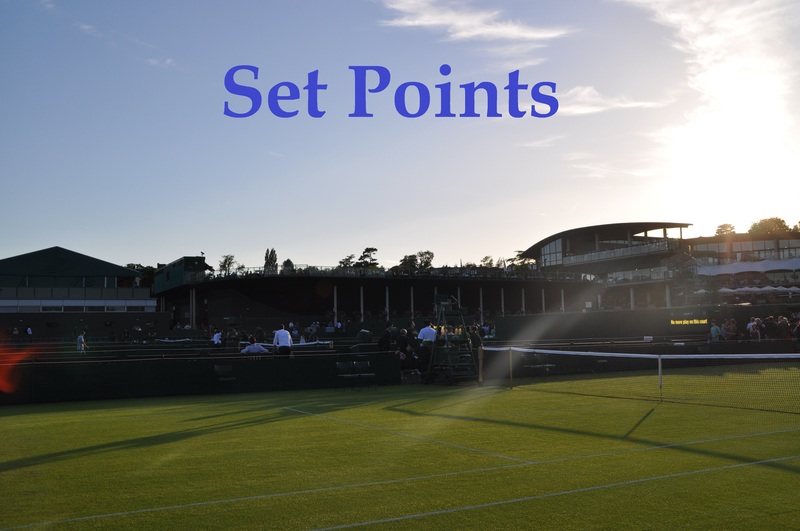 Kiki Bertens took out the number 25 seed, Anastasia Pavlyuchenkova, 6-1 4-6 6-1 – Pavs is now on a four match losing streak, while Bertens is up to 21 match wins for the year. Magda Linette reached the third round after Jelena Jankovic retired just one game into their second round match with a shoulder injury. Jankovic looks like she's strained a muscle in her neck/shoulder or something. Barely serving during warming. March 26, 2016 in Miami, Set Points, WTA. Just quickly on the Cibukova vs. Muguruza match. Well done to Garbine who obviously played well, but I feel for Domi right now. Aga was kind enough to say after their match that she thinks Domi belongs in the top 20, and she’s probably right. At the moment, however, Domi seems to be condemned to lose narrowly to players such as Garbi and Aga whose rankings are way above hers; so she can’t improve her ranking significantly. year holiday from the tour or (to stretch the point somewhat) even a twenty year one and come back as a top 5 player. Its exactly where Vika was last year in fairness. I think for Cibulkova the answer would be to play in smaller events to get match wins together. The points available for making deep runs in international events are plenty enough to get into the top twenty. If she’s able to get through this period she will be a better player for it(that’s really her challenge level, top 20 players). Her issue really is not the ability to go toe to toe with the top players, but closing out the matches when the opportunity presents itself. Since July of last year, it’s been this way, great three set matches with top players, never closing it out. I think physically, her body is coming together, but mental match fitness is not quite there yet. Unfortunately, she’s mostly been a first half of the season type of player, and the hard court surfaces are running out. I hope the injury lay-off changes this and she paces herself for a full season. Like Andrew said, even winning a ‘smaller’ tournament will be a very good psychological boost. Vika has a brash personality which helps her through this sort of stuff unlike Domi who is seemingly a more congenial, friendly kind I think. I would like her to be the perfect spanner in the works for some of these tournaments. It’s in her abilities. Good posts both. To be fair to Domi, she has played against Ana Ivanovic since her lay-off on two occasions and won both times, and one of them (at the US Open) was a three setter, so she can still do it; it’s just that she can’t seem to do it consistently. I wonder if she’s got a bit of a “choking” problem? Even before her lay-off I remember her one year (2012?) playing lights-out tennis for a set and a half against Vika in Miami, and totally dominating the match before letting Vika back into it, Vika eventually won. Maybe she needs to take a leaf out of Carla’s book and work with a sports psychologist for a while, and find out if there’s anything that’s been holding her back.